Heijunka Upgrade to the Deluxe or any Deluxe PLUS training packages adds lean mixed-mode flow and planning to your lean principles training events. 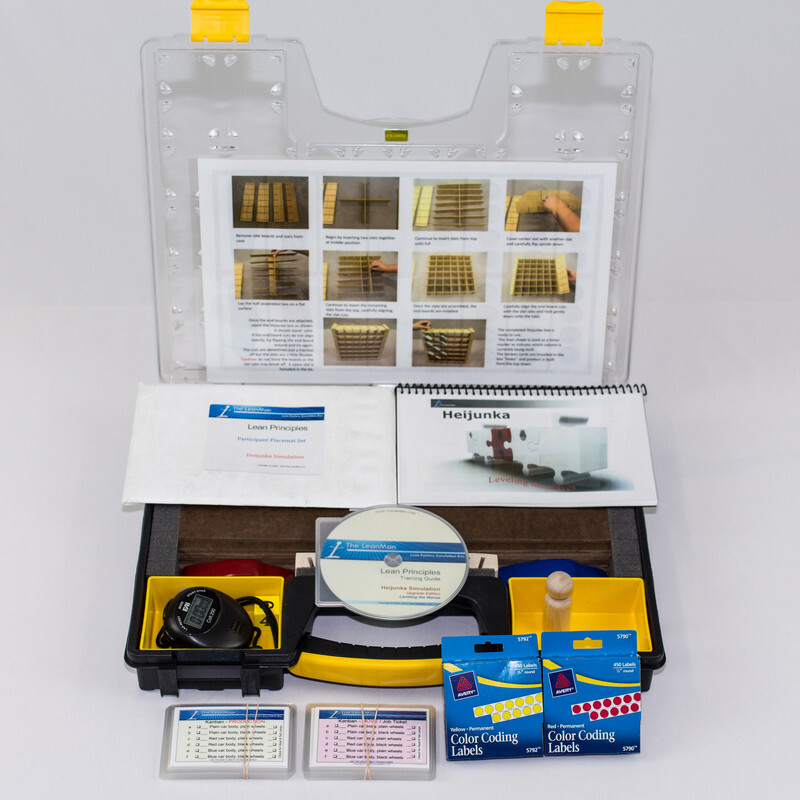 All materials are packaged in a single deep container approximately 16x13x2, or about the size of a thin brief case, for easy transport and setup. The Heijunka Box can be assembled in under 5 minutes. Note: Duplicate materials between the Deluxe or Deluxe PLUS package and the Heijunka upgrade package are not included. This upgrade in conjunction with a Deluxe Kit will equal a full Deluxe PLUS Heijunka Training Package. Upgrade your Deluxe Car Factory Kit, or any Deluxe PLUS Package, to include the Heijunka Simulation. 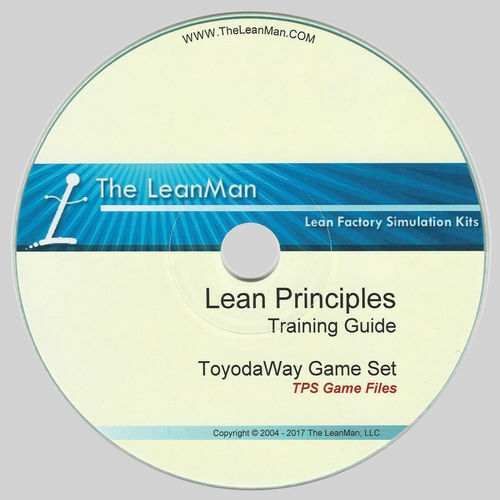 The simulation training will help participants understand how lean philosophy and techniques can be applied in a mixed-mode product cell to maximize customer value, minimize waste, reduce costs through workplace organization and visual controls, implement one-piece flow, instill quality at the source, and synchronize to customers needs using pull scheduling. Heijunka is for mixed-mode production where orders are randomly placed by multiple customers, so by definition, all models produced in the work cell controlled by the Heijunka box must meet the criteria established for the production line, i.e., uses same technology, requires a subset of the same resource requirements, meets a multiple of the flow rate requirements, and so on, plus it must have a turn rate such that several of them can be produced inside one pitch interval or time period. That way a mix of several models can be broadcast from the line to meet the random model demand within one interval. 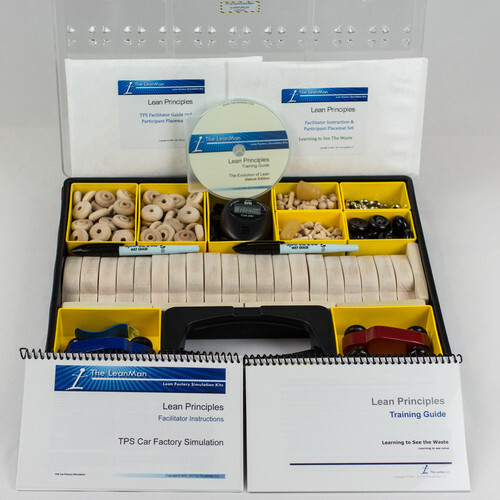 For a full description of the Heijunka capabilities and material items, please see the Deluxe PLUS Heijunka Lean Factory Simulation Package product description located on the Simulation Training products tab. Facilitators take note: Purchasing the Heijunka Upgrade as an addition to the Deluxe Car Kit, rather than purchasing the complete Deluxe PLUS Heijunka Package, results in obtaining the materials for each simulation packaged into two separate single-deep containers. This may be an advantage for those who would like to sometimes present the standard car factory simulations without toting the additional seven pounds of heijunka box with them each time. The “Leveling the Waves” presentation presents an alternate way of approaching the function of master scheduling and planning for a lean manufacturing environment. This presentation event is part of the Deluxe-Plus Heijunka Training Package.